Sit down and get comfortable, because this is going to be a longer than usual introduction. Let me start by saying that I'm pretty handy. Maybe it comes from being brought up by two engineers and living with a grandmother who was capable of using a hammer. But ever since I was little, I was fine building things, changing light bulbs, etc. Not surprisingly, when I moved into my new condominium, I had no problem attaching a curtain rod for my bedroom window, building an over-the-toilet cabinet (which had to be screwed into the wall! LOVE my drill) and hanging a mirror in my front entry way. I've also finally hung a metal strip in my kitchen which now holds my knives. But there was one project that I was frightened to complete: you see, my new bedroom set came along with a huge mirror that was supposed to be attached to the dresser. But I did not want to have a mirror attached to the dresser. I wanted it to be hanging on the wall. Simple enough? Maybe so. But I had mild panic attacks visualizing dropping the 25 pound mirror or drilling huge holes in my wall. And of course, like anything else, I was quite vocal about those mild panic attacks. That's when Mary stepped in and pimped out her husband Marcus! We decided to barter: I would cook a meal for Mary and Marcus, and Marcus would hang my mirror. Sounded like a win/win situation (and I'm not talking about the "winning" that Charlie Sheen is so proud of). I asked Marcus what he wanted for dinner and he said stuffed cabbage. But it could not be stuffed cabbage with cous cous or lazy stuffed cabbage. It had to be the real deal. And I was happy to oblige. Before you go ahead and read the recipe, I just want to let you know that the mirror is hanging on the wall (I also got Marcus to add extra wire to my other mirror so I can now hang it both horizontally or vertically because I like options), the dinner was a success, it was lovely to hang out with Mary and Marcus, and all the photos other than of the final dish I took at night on "auto" setting...so just be aware of that. This is what my kitchen looks like when I cook: a flipping mess! 1. 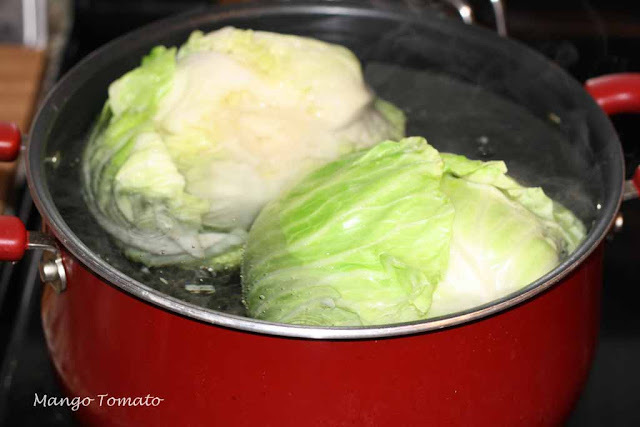 Using your largest soup pot, bring enough water to boil that will cover your cabbage. 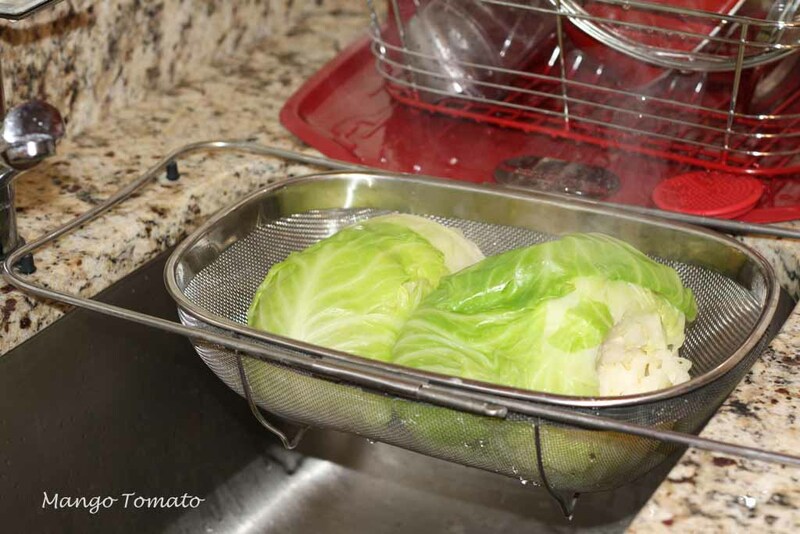 Remove the core from the cabbage (be incredibly careful) and add the cabbage to the water for 5 minutes. You want the leaves to soften up. 4. Carefully peel back the cabbage leaves and place them side by side. Creating an assembly line is the best when it comes to making this recipe. If you have helpers, that'd be even better! Using an ice cream scoop, add about 2-3 tablespoons of the mixture to each cabbage leaf (it all depends on how large the cabbage leaves are). 5. Roll them up like burritos. 6. 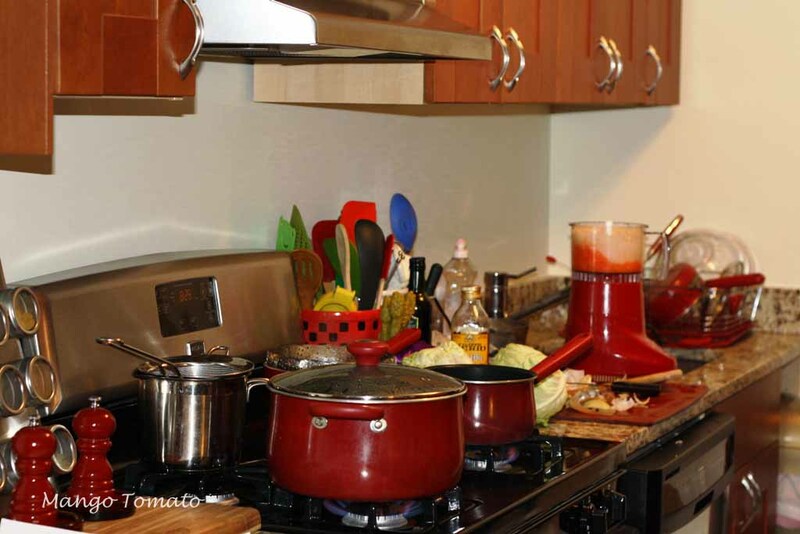 Add your crushed tomatoes and the same amount of water to a large soup pot and bring to a simmer. 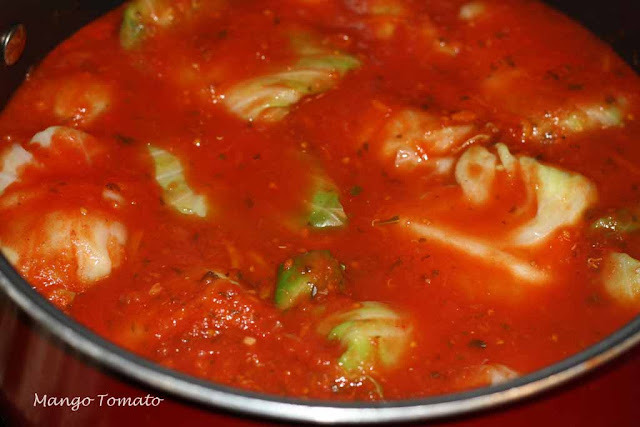 Carefully add stuffed cabbage leaves (I ended up making 22) to the tomatoes. Bring back to a simmer, cover, and simmer for about 45 minutes. 7. 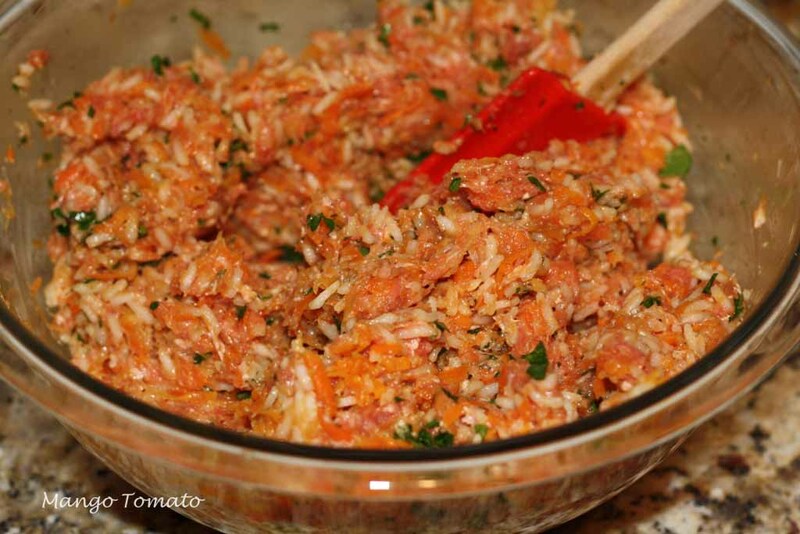 Make sure to test one of the stuffed cabbage leaves to make sure the ground beef is cooked all the way through. Serve with sour cream and parsley. Or/and shredded cheese and salsa. As this recipe makes quite a bit, feel free to freeze some or give it away to friends. 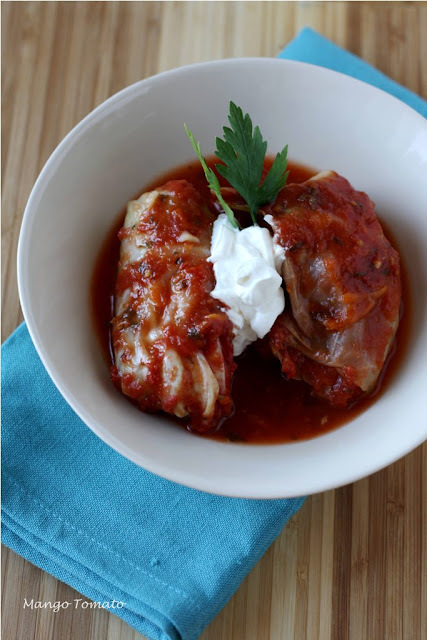 You can also bake stuffed cabbage without the tomato sauce or cook the rolls in a bit of water and then pan fry them. There are so many options! I love tools, just like you :) Yesterday, I was looking for some pliers and my husband came swooping over to "rescue" me when I reminded him that I'm quite handy, LOL. Good for you and your projects! And I love this recipe for stuffed cabbage, my family will love this! After having to have my eyes irrigated (yes, seriously and it was horrid!) for trying to do stuff myself, I decided its just better to have someone else do it. THat being said, its so cool that you are so independent. And the stuffed cabbage, it is nothing short of a work of art. It really looks delicious. Very cool, I'm actually planning to make these this week! And I haven't made them in such a long time. Looking forward to having Hannah try them, I don't think she ever did. I too like to be entirely self sufficient when it comes to being able to handle tools and stuff.. :) But well, since I have a guy running around the house who thinks he is better with these things then I am he's usually the one doing them. Still, I am not complaining. I know I could do it if I had to! Although hanging that mirror I would have needed serious help! 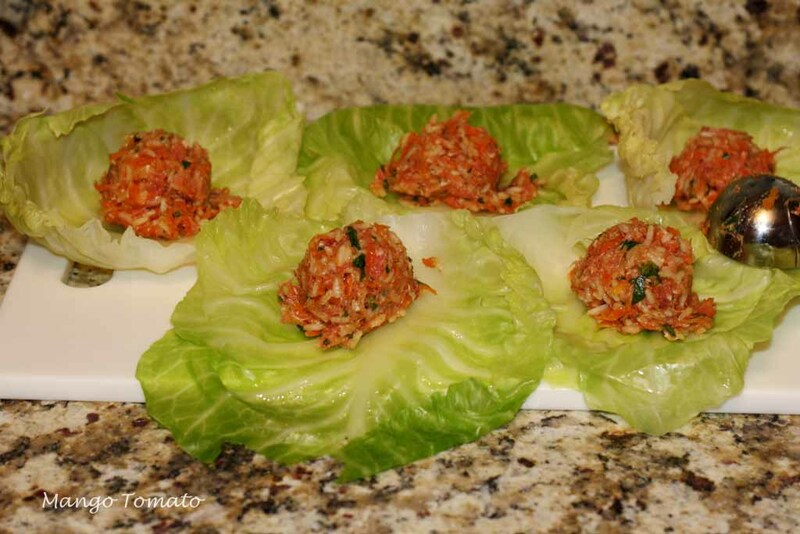 Your stuffed cabbage looks incredibly delicious! I think you and I should have a "who can make this kitchen the messiest" contest. Impressive! I just made some rolls with collard leaves and now I'll have to try some with cabbage. These golubtsi look amazing! I used to hate them when I was little but I've grown to really appreciate them. And your kitchen is not a mess! It's beautiful. My counter looks like that when I cook too! I love stuffed cabbage. I need to get home and have a cooking day with my mom. 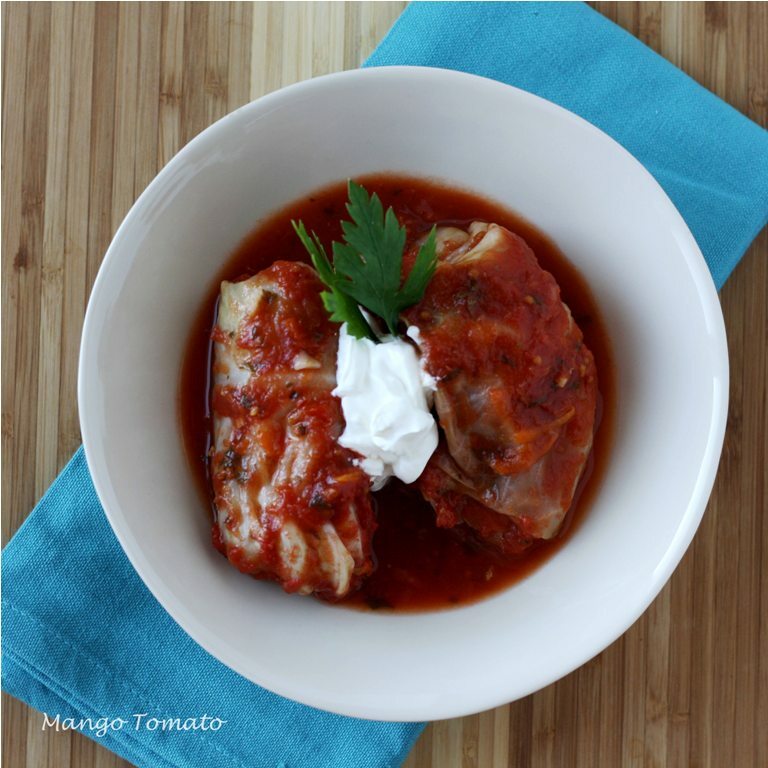 We churn out stuffed cabbage, stuffed peppers, and more and stock up our freezers. She tops hers with a sauce concocted with tomato soup and some other stuff. It's really good, but your sauce sounds delicious too! Hey there! Just found your blog from Oats & Spice on Twitter #FF! You have THE most gorgeous photos! Wow...I just keep staring at that bowl of stuffed cabbage! I'm totally adding you to my Google reader! 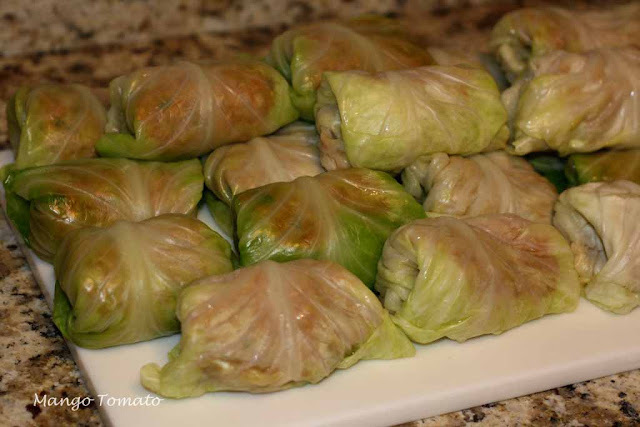 My husband was just telling me that we need to try stuffed cabbage. His family is Polish and his grandmother used to make it all the time. So glad to have this recipe for when I give it a try! 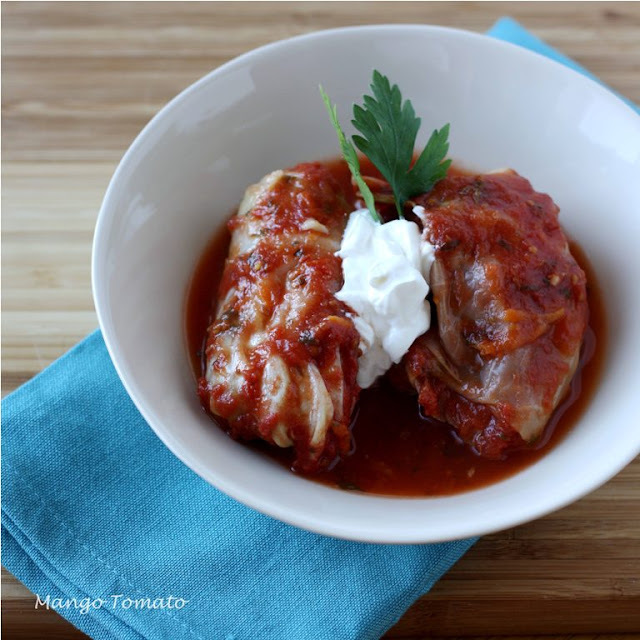 That stuffed cabbage looks really good! Love your site. The pictures are so helpful. Do you have any tips for carefullly coring the cabbage? These were real yummy! Thanks for the recipe. I added a bit of heat (one whole, dried hot pepper to the sauce) for a little kick. I'm so glad you liked the recipe and adjusted it to your liking!